Robert Doty, as Minnesota Lottery’s executive director, can’t play lottery games — so he can’t win. But he gets to do perhaps the next best thing: Presenting oversized checks in the “winners room” at the lottery’s Roseville headquarters. “If I get a chance to play just a small piece of that, to helping to change someone’s life in a positive way like that, who could ask for anything better?” Doty said. Doty, appointed by Gov. Mark Dayton, has led the lottery since May 1. 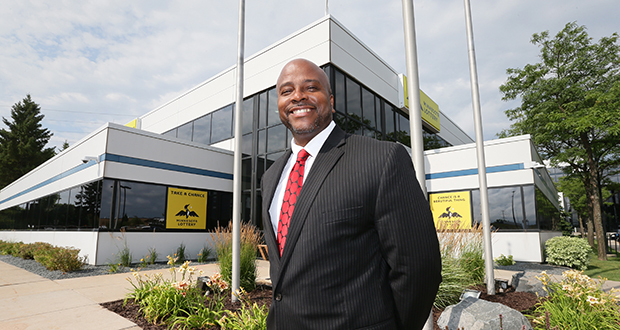 He has three decades of financial and organizational management experience, including serving as the chief financial and operations officer at Harvest Network of Schools and chief financial and operations officer for Minneapolis Public Schools. “There are a lot of pieces to my background that I think will be helpful to moving the lottery forward,” Doty said. The lottery in 2016 had record sales of nearly $593 million and record prizes of close to $366 million. A. Just walk up and say hi. I’m kind of an easygoing guy. I’m probably not a very good initiator of conversation with people I don’t know, but I quickly jump in. If someone initiates a conversation I’m right there and then we start. A. The first candidate I voted for was Walter Mondale. I was excited about his Minnesota connection and what he stood for. A. The one that I picked up in the last few weeks here is Al Franken’s new book (“Giant of the Senate”), which is pretty good. A. Ridiculously slow drivers. The other one is people who are chronically late. This is a battle I fight at home with my wife all the time. A. I’m an avid weightlifter. I probably lift five to six days a week. I’m a member of a men’s choral ensemble at church. I spend a lot of time practicing with those guys. A. Whenever someone comes here we end up going to the Mall of America. Then we stay there for probably a good day. When I have family in particular coming from out of town, that’s the one thing they want to see. My daughter just had her high school graduation, and we had a number of family in town. We were preparing for the party, but a group of my family had to leave to go to the Mall of America. A. I would have to say my accounting professor was someone who was very instrumental. Equal to that would be my mother. She taught me really important lessons particularly about the importance of a work ethic, the importance of integrity, standing for what you believe. I attribute a lot of who I am today to some of those life lessons that she taught me. Q. The highlight/lowlight of your daily commute to work is? A. Construction on 94 would be an absolute lowlight. I live in Woodbury, so trying to get from Woodbury into St. Paul at times has been quite the challenge. The highlight quite frankly has been [finding] alternative routes so I’m able to go from this door to my home without getting onto the freeway. When I’m in the car, usually I’m that guy who’s got the music turned up really loud. I’m probably singing with whatever’s on the radio or on Pandora or Spotify. That’s my time to think and to kind of meditate a bit, to reflect on what happened that day and what I have to do the rest of the week or whatever I’ve got to do when I get home.